Farkle, also known as Farkel, is a simple, strategic dice game best suited for three to eight players. Like Yahtzee, the game centers around rolling standard dice to score points by various roll combinations. While game retailers sell special Farkle sets, all players need for a basic game is six standard dice and a pad of paper and a pencil to keep score. Each player rolls a single die, and the highest roller plays first, with play continuing clockwise. The player rolls all six dice and determines the number of scoring dice from the roll. The player can choose to take the score of the roll and pass the dice to the next player or continue rolling for more points. If the player decides to continue, he or she chooses which scoring dice to set aside—players can reroll scoring dice but must set at least one scoring die aside—and rolls the remaining dice again. 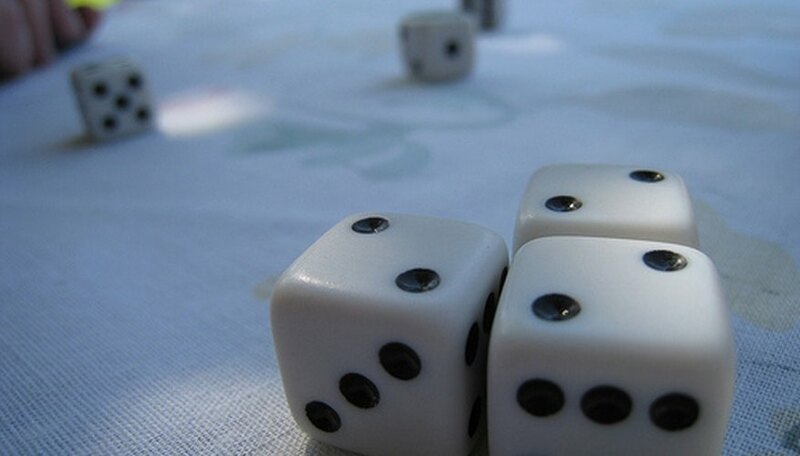 "Hot dice" denotes any roll in which all dice are scoring, and the player can roll all six dice again if continuing the turn. The player continues until either he or she decides to stop and take the cumulative score for the turn or until "farkling," a roll of the dice that scores no points. Any player who farkles loses all points for that turn, and play proceeds to the next player. When a player passes 10,000 points, each remaining player gets one more turn to try to exceed that player's score. The highest scorer at the end of that round wins. Ones and 5s are each worth 100 and 50 points, respectively. Rolling three of a kind is worth 100 times the number's value: three 3s are worth 300 points, for example, and three 6s are worth 600 points. Three 1s, the exception, are worth 1,000 points. A straight, rolling the numbers 1 through 6, also is worth 1,000 points. Scoring dice can come only from a single roll. If a player set a 1 aside for 100 points, for example, that player cannot claim a three of a kind if he or she rolls two more 1s on the next roll. Player one rolls three 2s, two 4s and a 6. She sets aside the three 2s for 200 points and rolls the three remaining dice, rolling two 1s and a 4. The player takes the two 1s for 200 points and ends her turn with 400 points total. Player two rolls two 1s, a 5 and three 6s, a hot dice roll worth 850 points. He rolls again and gets a 1, two 2s, two 4s and a 5. The player sets aside only the 1 and rolls five dice again, rolling a 2, two 3s and two 6s—a farkle. The player loses all points, and play passes to the next player. Players have developed several common variations of the standard rules. The most common variation requires players to score at least 500 points for their first scoring turn. Some require players with hot dice to roll again at least once. Some variations deduct 1,000 points from a player's total after every third farkle. Some also allow for other scoring options: 500 for three pair, doubling the three-of-a-kind value for a four-of-a-kind and tripling the three-of-a-kind value for a five-of-a-kind. For the rare six-of-a-kind, some games value it at 5,000 points and others an instant win.